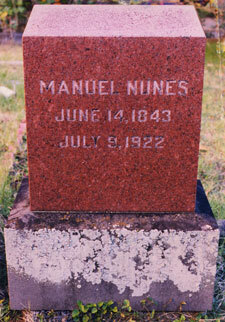 On August 23, 1879, Manuel Nunes (1843-1922) arrived in Honolulu harbor, island of Oahu, aboard the ship Ravenscrag. He had emigrated from his home on Madeira, an island off Portugal. Nunes, Augusto Dias and Jose do Espirito Santo, brought with them the Madeiran machete that would be transformed into the Hawaiian ‘ukulele we know of today. Hawaiian King David Kalākaua popularized the new instrument, and soon everyone wanted to play it. Nunes “established himself as one of the earliest ‘ukulele makers and operated his manufacturing company for over 40 years, much longer than any other. 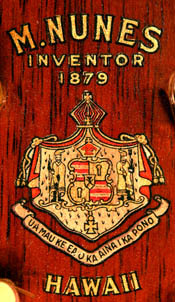 Many of his handcrafted instruments bore the label M.Nunes, Inventor of the Ukulele and Taro Patch Fiddles in Honolulu in 1879.” Samuel Kamaka apprenticed with Nunes, and would later pass on the skills to his sons and his own company known for high quality ‘ukulele construction. 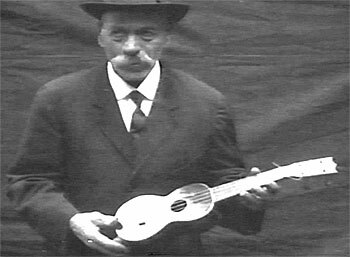 Read more about the Ukulele Hall of Fame Museum and 1998 inductee Manuel Nunes.